ONE of the most important characteristics of electricity is the extraordinary facility with which it may be transmitted from place to place. By virtue of this property, electricity has revolutionized industry. At one time any industry requiring mechanical energy had to generate its own power where it was needed. 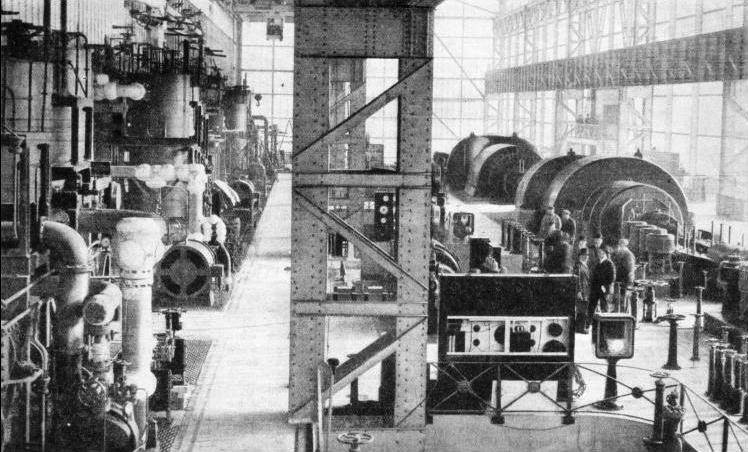 An industrial enterprise wanting power on a large, scale had to sink a large proportion of its capital in plant for the generation of this power. The steam engine was responsible for the concentration of industry in regions where coal was plentiful. To-day, power is bought and sold. It may be generated in one part of the country and consumed in another, and the medium used for its transmission is electricity. Electricity is not an original source of power or energy. The dynamo absorbs energy from some agent which drives it, and gives such energy out in the form of electricity. Electricity has an enormous advantage over many other forms of energy, since it may be carried over long distances without serious loss and then reconverted into any particular type of power required for industrial needs. ONE OF THE TOWERS at Dagenham, Essex, where the Grid crosses the Thames. Two such towers, each 487 feet high and weighing 290 tons, carry the high-voltage line across a span of 3,060 feet. This section of the Grid connects the power station at Barking with a switching station, the largest in the country, at Northfleet, Kent. The electricity supply industry first took practical shape in the early 'eighties. In 1882 was passed the Electric Lighting Act, which controlled the conditions in which electricity could be sold for public supply purposes, and dealt with the licensing of local supply authorities, private individuals and companies. By 1900 the Metropolitan area was being supplied by local authorities and private enterprise, and many of the provincial towns had begun to provide a public supply of electricity. At the end of that year nearly every large town in the country had its own electricity department. This extraordinary development in the course of eighteen years may be traced to two important technical factors. The first was the move towards the substitution of the steam turbine for the reciprocating engine. This meant that powerful plant could be placed in the hands of a relatively small staff, and so the conditions essential for the development of large central supply stations were fulfilled. The second factor was the development of the alternating current motor. Alternating current had for a long time been used for lighting, but the alternating current motor made it possible to use the same type of current and the same source of supply for power and lighting. Alternating current (a form of electricity whose direction of flow is constantly changing) has an enormous advantage over direct current. It may be readily transformed from a heavy flow of current at a low pressure (voltage) to a small current at a proportionately high voltage. In the form of low current and high voltage, electrical power may be most economically transmitted over long distances. The high voltages used in the national transmission system overcome the effects of the resistance of the enormous lengths of line over which the electricity is conducted. At a generating station, therefore, the output is "stepped up" by transformers to the highest practicable voltage, and at the distribution centres it is transformed down to the lower voltages used by the consumers. Although what may be called the flexibility of electricity has been fully realized since the beginning of this century, full advantage of this attribute was not taken until comparatively recently. Electricity could be generated at a convenient, centrally placed location and circulated to outlying districts in every direction. Yet there were innumerable small concerns all over Great Britain, each generating electricity to serve local needs. Some concerns were hopelessly incapable of filling those needs. Others were too ambitious and could not be run at a working profit. Matters were further complicated by the fact that the electrical needs of a given community could not be estimated from one year to the next. A new industry would spring up, and the potential consumption of power would increase to an extraordinary degree. In 1919 an Act was passed which made provision for voluntary co-ordination between supply undertakings on a regional basis, the central body which was to control matters being the Electricity Commission. This body was set up to "promote, regulate and supervise the supply of electricity". The country was to be divided into electricity districts, each under a Joint Electricity Authority, and each having its own generation and transmission system. Scarcely was this scheme under way when the Electricity Commission began to investigate the possibility of reorganization on a national scale. The Commissioners reported that lack of co-ordination had caused "unnecessary expenditure of capital, wasteful consumption of coal, and higher charges for electricity than would have been the case had there been larger areas of supply and more economically situated power stations". The Conservative Government of 1925 set up a Committee, which recommended that a new central organization - the Central Electricity Board - should be created, to regulate the production of electricity throughout Great Britain. A FEW highly efficient stations, which were to be interconnected by a main transmission system operating at 132,000 volts, were to replace a much greater number of small stations. Thus the work of the Board, begun in 1927, was to concentrate the generation of energy in a limited number of selected stations, and to erect a national high-tension network which would interconnect these stations with one another and with the systems of all other undertakings. The Board was also responsible for supplying any authorized undertaking requiring electricity in any area which it could supply. Prices were to be fixed in accordance with a special tariff drawn up by the Board. In September 1933, less than six years after work had been begun, the last tower for the main transmission system was built on the outskirts of the New Forest, in Hampshire. In the National Power Network (now commonly known as the Grid) there are 4,075 miles of transmission lines, supported by 27,660 towers, averaging 75 feet in height and three tons in weight. These towers extend in a never-ending row across quiet stretches of country or through the suburbs of large towns. Few people, however, realize that these towers form so vital a link in the efficient distribution of electricity. There are not many underground power cables. These are mainly used in the hearts of cities, and in other places where the more economical overhead transmission would be impracticable. 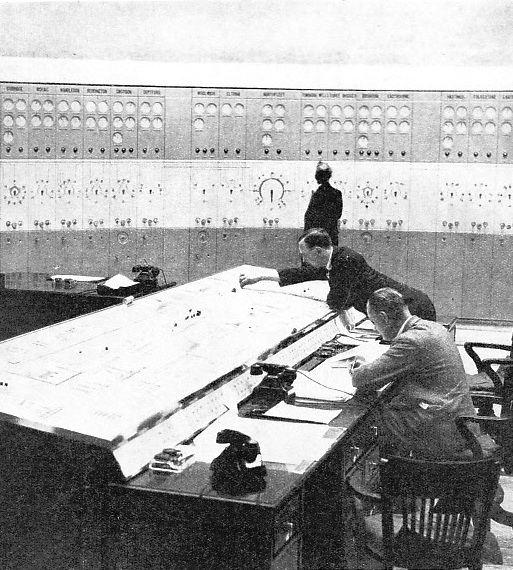 THE INTERIOR OF A CONTROL ROOM, which is connected by private telephone lines with all the generating stations in its own district. Switchboards, dials and light signals keep the control engineers acquainted with the working of every station and with the fluctuating state of the demand for power by all the local consumers. The Grid lines had to cross about sixty rivers. These crossings often involved the building of enormous pylons, to raise the conductors to a height that would not interfere with shipping. The Thames is crossed at Dagenham by two towers each 187 feet high and weighing 290 tons. The span of the conductors between them is 3,060 feet. Other notable towers are used for crossing the Forth at Kincardine, the Roding at Barking Creek, the Severn at Upper Arlingham, and the Clyde at Yoker. Nearly every important town in Great Britain is served by the Grid, so called because its transmission lines, which cover the country, resemble a gigantic gridiron. On the west a primary line runs from Glasgow southwards to the Galloway water-power stations. Thence it proceeds through Carlisle, Lancashire, Stoke-on-Trent, Stafford and Worcester, after which it links up with the power station at Tir John, Swansea, and continues via Bristol to Hayle, near Land's End. On the east another line runs from Dundee to the south coast, via Edinburgh, Dunston-on-Tyne, York, Lincoln, Peterborough, Bedford and London. The whole system is planned in large rings which link up all the important towns in such a way that duplicate supplies are available. Thus if a section of the line is out of service for maintenance or repair, supply is not interrupted. The wiring of the Grid constitutes a transmission system which may truly be described as national. Many power companies and local authorities had already evolved important local transmission systems, but these tended to be isolated from one another, and required some connecting link. This has been provided by the Grid. The building up of the Grid system, occupying nearly six years, was responsible for intensive activity in a wide range of industries. Its ramifications extended to coalmining, iron and steel manufacture, cable-making, electrical engineering, and the cement and pottery industries. More than 150,000 tons of steel were used, mostly for the building of the transmission towers which now straddle the country from the Grampians to the south coast, and from East Anglia to Land's End. Some 12,000 tons of aluminium were used for the overhead lines of the Grid. Nearly all this aluminium was produced in Scotland at a factory which generates its own hydro-electric power. At factories in the Midlands the moulded aluminium bars were drawn into wire and stranded with steel for the overhead conductors. Copper wire was required for underground cables, which are of many types. Some of them, operating at 132,000 volts, are filled with oil to provide the high degree of insulation necessary. Others. working at 66,000 volts, are of a more recent type, being drawn in steel ducts filled with nitrogen under pressure. The transmission system in the London area includes 102 miles of underground cables. The production of the porcelain insulators required for the overhead system gave rise to much industrial activity of a specialized type, since more than 200,000 units were needed. The basic materials in their composition are china clay, felspar and quartz. Finely ground, these ingredients are mixed with water, sifted in drums and filtered, the resulting mixture being pressed and moulded. The moulded shapes undergo processes of glazing and firing in kilns, whence they emerge to be ground to the right size. Each insulator is subjected to an exhaustive series of tests to prove its mechanical strength and insulating properties. Many special types of transformers and switching gear were also necessary to deal with the high voltages at which electricity is transmitted over the Grid. Transformers are used to increase the voltage at which electricity is generated, for the purpose of transmitting it over the main lines. Transformers are also used to reduce these high pressures to voltages which may be conveniently distributed by local undertakings to their consumers. THE NATIONAL NETWORK of high-voltage transmission lines, shown in simplified form. 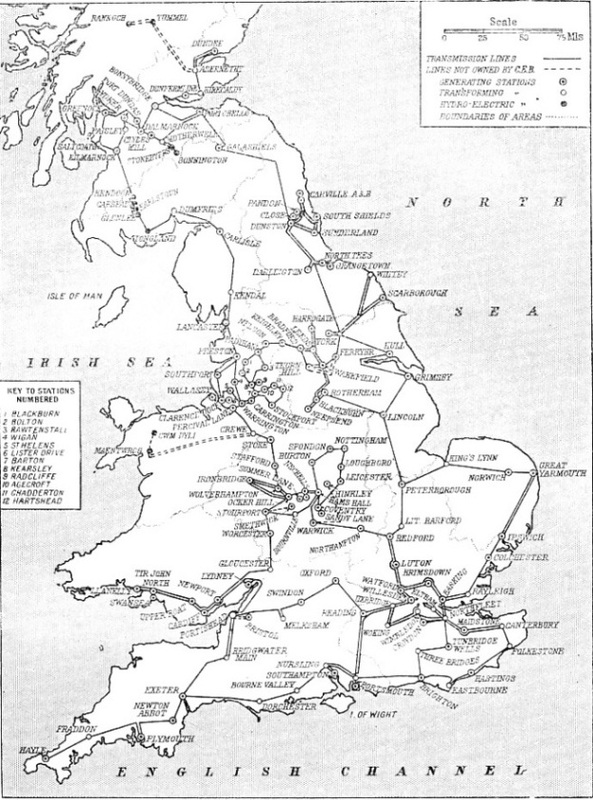 Great trunk lines run from Glasgow to Hayle (Cornwall), and from Dundee to Brighton and south coast towns. Lines running east and west join up these trunk lines with every important industrial centre in the country, and secondary extensions (not shown in every instance) distribute power to nearly every town in Great Britain. The building of the Grid towers and the installation of transmission lines was not an excessively difficult matter. In some instances, however, as for example in marshy ground, the preparation of the foundations for the towers necessitated the driving of piles deep into the soil. The assembling of the tower sections, the hoisting and bolting together of the steel frameworks, and the fixing of the cross-arms to carry the insulators and conductors called for the highest qualities of steadiness and nerve on the part of the workmen, often at great heights from the ground. The tension on the conductors strung between the towers was scientifically regulated, and the transmission lines were installed and tested ready to be put into service. When the scheme is complete, some 145 stations will be used for permanent operation under the National Power Scheme. 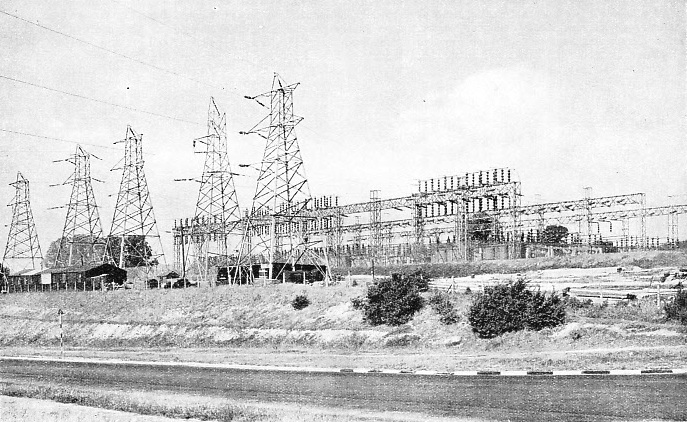 In 1936 the plant capacity of the stations in use ranged from 10,000 kilowatts to 390,000 kilowatts. The larger figure is the capacity of the station at Barking, Essex, where the steam-raising plant for the turbogenerators consumes more than 1,100 tons of coal every day. Some of the smaller stations come into action only during peak periods, and they may shut down at week-ends, when industrial demands are low, or in the summer, when heating and lighting demands are small. This flexibility constitutes one of the main advantages of the Grid system. The smaller and less economical stations are being closed down, in accordance with the original plan, until the scheme works at maximum efficiency with the smallest possible number of stations in operation. Sixteen new stations specially scheduled for the National Power scheme, ten of which were already in operation in 1936, include the five hydro-electric stations which use the water power resources of the west of Scotland. Without the Grid these could never have taken their part in the efficient distribution of energy over the whole of Great Britain. Some of the new stations in England, such as those in London at Battersea and Fulham, have been designed on the most modern lines, and use the most up-to-date plant for fuel handling. steam raising, generation and control, as well as for the prevention of atmospheric pollution by smoke and gases. At Battersea and Fulham the fuel-handling plant includes a telpher or moving belt by which coal, brought up the river by barges or colliers, is weighed and conveyed directly either to the storage dump or to the boiler house. The boilers are fed by automatic stokers and are equipped with pulverized fuel plant, superheaters, air pre-heaters and smoke-cleansing plant. Working at full load capacity, these stations require about 10,000,000 gallons of water an hour for condensing purposes. In the larger power stations energy is normally generated at 11,000 volts and is then passed to a transformer which steps it up to 132,000 volts for transmission to a switching station. At such a station the power may be stepped down again to 66,000 or 33,000 volts before being transmitted over secondary lines to local undertakings. Close watch is kept on the incoming and outgoing power, which is metered by elaborate apparatus that keeps an accurate register of the quantities received and dispatched, the records of consumption being printed automatically every hour. FROM the main dispatching stations the power is transmitted to the points at which it is tapped off and further reduced for local distribution. Electric railways or factories may require their electricity at fairly high voltages. Farms and villages will want it at the lower voltages associated with the ordinary domestic supply. Different types of transformers are adapted to meet the local needs. In small villages the transformers may be placed in kiosks. For individual farms or for small groups of private consumers, compact transformers may be mounted inconspicuously on poles. Since the efficiency of the system depends upon the effective control of generation and transmission, strategic points in each area are provided with fully equipped control rooms, connected by private telephones with all the generating stations in the area. 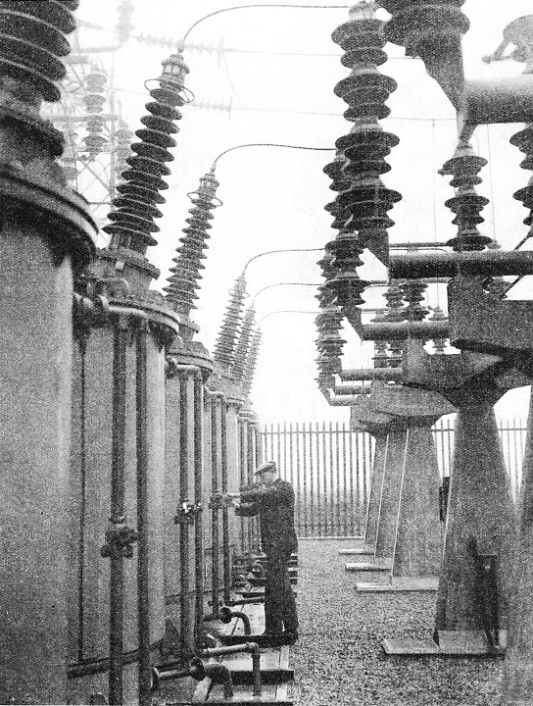 By a complicated combination of switchboards, dials, light signals and telephones, controllers in these nerve centres are kept in constant touch with the working of every station, and with the fluctuating state of the demand for power, as indicated by special apparatus in the switching stations. OIL CIRCUIT-BREAKERS at the sub-station of the Grid at Southwick, Sussex. Transforming and switching stations often deal with voltages as high as 132,000. The production of suitable porcelain insulators has given rise to much specialized activity, since more than 200,000 of them are used in the Grid system. In the control rooms of the more modern generating stations automatic recorders log the performances of the machines, inscribing lines on graphs for each twenty-four hours. Recorders for the turbines keep an account of the temperature of the incoming and outgoing steam and of the oil. The engineer in charge can find out, by pressing a button, anything that he wants to know about, the running of any of the machines in his charge. Control engineers are thus able to order the operations of generation and transmission so that the load may be spread over the interconnected stations to give the most economical and reliable results. Considerable changes have taken place since the Grid was first devised. The total annual output of electric cookers, for instance, has increased by 1,000 per cent since 1931. The output of vacuum cleaners in 1930 was about 40,000. In 1936 it exceeded half a million. Intensive electrical development propaganda over a period of five or six years has been responsible for huge increases in the use of electricity for domestic purposes. This propaganda, though frequently carried out through local supply undertakings, has been inspired to some extent by the Central Electricity Board. The existence of the Grid has brought electricity to localities which could never have been served without it, and their consequent demands upon it are causing a steady expansion of the system. Rural industries have been enabled to expand, and the growth of combined agricultural and industrial plants has been stimulated. The Electricity Commission, working on the assumption that the demand for electricity would steadily increase, gave, in 1935, an estimate of the output that would be demanded in 1940. The rate of growth up till 1937 indicated that this figure will be reached by 1938. THE growth of railway electrification has been another important factor. New and highly efficient stations will be required for railway supplies as electrification extends, and these stations will be operated at non-peak periods to generate electricity which can be supplied at a low price to local undertakings for other purposes. The increase in the use of electricity for large-scale industrial undertakings, as distinct from the smaller domestic users, has also been a marked feature of the last, few years. As an instance, it is stated that the capacity of electric motors used for industrial purposes has increased fivefold during the past twenty-five years. The electrical lighting and heating of large factories, and the consequent elimination of boiler-houses, flues, smoke and dirt, have assisted in the reduction of labour charges and building costs. The average cost of electricity production by all public utility companies in Great Britain has shown a marked reduction since 1933. Such a reduction is inevitably responsible for a greater demand for electricity, which will, in turn, give rise to further reductions in cost. The original idea that all electricity producers should be under a central control has proved to be correct, and the existence of the Grid is more than justified. A second important function of the Central Electricity Board in the co-ordination of the national supply was the standardization of the frequency of the alternating current - the rate at which the current changes its direction of flow. If the frequencies of different supplies were to vary, even to a minute extent, considerable trouble would be experienced in linking them up one with another. They must be accurately synchronized. The national standard is 50 cycles per second. Certain areas, notably the Clyde Valley, north-east England and part of South Wales, had already been developed on a non-standard basis, in some instances operating at frequencies of 25 and 40 cycles per second. The conversion of the generating apparatus used in such areas involved not only the rewinding of the main alternators and other large equipment, but. also the provision and installation of many thousands of new electric motors in consumers' premises. IN THE HUGE POWER STATION AT DUNSTON-ON-TYNE, one of the more recent stations operating in the Grid scheme. This station, which has a capacity of 150,000 kilowatts -equivalent to some 200,000 horse-power - is housed in a magnificent building of steel and glass. It was opened in February 1933. The total cost of frequency standardization is estimated at about £19,000,000. An indirect result of the progress of the scheme is the complete reliability of the modern electric clock, which is supplied, by the mains, with synchronized impulses which are constant to an extremely high degree of accuracy. Plans for the future development of the Grid provide for considerable extensions in the output capacities of some of the more modern generating stations. The station at Battersea, the two chimneys of which have established themselves as one of London's newer landmarks, is to be doubled in size. All the new stations, in accordance with the policy of the whole scheme, have been arranged for large-scale production. Battersea will ultimately have an output capacity of 480,000 kilowatts. Ironbridge, Shropshire, serving the Central England area, will generate 200,000 kilowatts. Clarence Dock, Liverpool, and Tir John North, Swansea (South Wales), are two more stations which will be among the most important in the country. The magnificent steel and glass building at Dunston-on-Tyne is already recognized as a model on which many future generating stations may be designed. To meet the rapidly increasing demand for electricity in south-east England, a new station has been planned for Dartford, Kent. The first section of this station will have a capacity of 120,000 kilowatts, and should be ready by 1940. The site on which the new station is to be built is capable of development to permit great extensions when necessary. PRIVATE lines for supplying the needs of great industrial undertakings have recently been installed in many parts of the country. Thus new industrial areas, with electricity as the sole source of power, are springing up in many regions that were once thought unsuitable for such development. The electrification of the home has spread through rural areas, with a consequent improvement in the standard of amenities. Electrical showrooms in small towns are visited by village housewives, who see the latest appliances and are not slow to realize their advantages. The farmer's wife feels that she has a right to expect that her kitchen shall be at least as well equipped as the farmer's workshop, and through the use of travelling showrooms the amenities of town have invaded the country. In farming, the function of electricity has been to reduce expense and to increase efficiency and improve hygiene. Electrification has produced its most striking effects in the dairy and poultry branches of farming. It has, however, effected a general improvement in cleanliness because of the installation of electric motors for barn machinery and for pumping equipment. The policy of the national electrification scheme is thoroughly consistent with the recommendations made by the Weir Committee in 1925. The most efficient generating stations will be run at their maximum ratings, and the smaller and less efficient stations will be used only for shorter periods, to satisfy peak demands. As the scheme expands - as it is bound to do for many years - the size of the large stations will be increased, in preference to making any additions to the number of stations in use. Thus the production and large-scale transmission of electrical energy will be controlled, and electricity will ultimately be available, without interruption, in any part of the country, for the service of more than 40,000,000 people. THE LARGEST SWITCHING STATION IN GREAT BRITAIN, at Northfleet, Kent. Such switching station serve as distributing centres, power being trasnmitted to them at a voltage of 132,000. The voltage is stepped down to 66,000 or 33,000 for transmission over secondary lines to local supply undertakings, after which it is transformed to whatever voltage is required. You can read more on “Power From Scotland’s Lochs” and “The Shannon Power Scheme” on this website.